Four weeks ago I shared my New Year’s Resolutions through our weekly blog… Let’s see how I’ve been getting on. One of my resolutions was to be able to touch my toes, easy for most people, but flexibility has never been my strong point. Since a young age, I have always been an avid horse rider. But warming up before and stretching after riding never came to mind, as I would always be jumping onto the next horse or onto another job. This has resulted in tight/shortened hamstrings that I have always neglected. My Resolution – To stretch my hamstrings every day. I train in the gym 5 days a week and I always forget to stretch after my sessions. So, this year I am making a conscious effort to stretch after each workout, or if that fails, stretch while I’m waiting for my dinner to cook. Stretching has been going well … as you can see from my before and after picture (still a way to go). However, it has uncovered a in balance that I never knew I had. Towards the end of my third week of stretching, I started to experience a gradual onset of knee pain in my right knee. To start with I ignored it, thinking I had maybe tweaked something in the gym during a leg session. But the pain persisted – waking me in the night and pain during walking and rest. With a gradual onset of pain, and no impact to my knee which would cause an injury, I knew if would be something internally. So, I turned to Matt, the head physio at Comfort Health for a quick assessment of my knee to see what was going on. From my daily stretching my hamstrings have loosened, which is great news. But in doing so it has caused instability of my right knee. From examination, it has shown that my knees are hypermobile, something I never knew due to my hamstrings being so tight. So, with my increased hamstring flexibility it has led to increased movement of my knee, which has then aggravated my joint line and under my patella. To be able to reduce the aggravation of my knee joint I need to strengthen the weak muscles around my knee, to improve knee stability. Further teasing showed weakness in my VMO muscle in inner range (a little muscle that sits above my knee cap off to the inside of my leg) and my right hamstring muscle in outer range. This does not mean that I should stop stretching my hamstrings, just that I need to incorporate some focused strengthening exercises into my daily workouts. These are the exercises I’ll be incorporating into my daily training to strengthen my VMO and Hamstring, hopefully reducing my knee pain. With this exercise I’ll be pointing out my right toes (on the block) to really target my VMO. The pistol squat using a TRX is a great exercise for all round strength targeting all muscle around the knee. I’ll perform this exercise on both sides to improve my general strength. 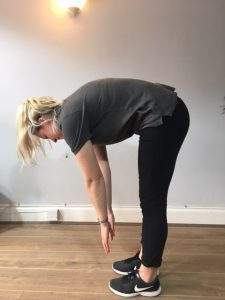 I’ll start off with both feet on the exercise ball, which then I can progress to my right foot on the ball with holding my left leg in the air. This exercise is all about control as you roll the ball away from your body. This exercise is a step up from the above exercise. Again focus should be all about control and stability as your feet reach out away from your body. Stay tuned to find out what happens after a month of training…. If you have any niggling injuries like myself from your New Years resolutions, get in touch today and book in to see one of the team!